A chart out there has gotten people excited lately, one that purports to show a phase transition in debt, with increasing dollars of debt causing ever-smaller increases in GDP. And now, pace the phase transition comment, debt is causing GDP to actually shrink. True? Interesting question. There should be no doubt that infinite amounts of consumer debt won’t generate any higher gains for a society than will debt for a company. As a matter of fact, declining returns at the margin are guaranteed, and should come as no surprise. After all, if we could just lever our way to a sustainable GDP of 2x current levels then we should just do it. Why screw around? 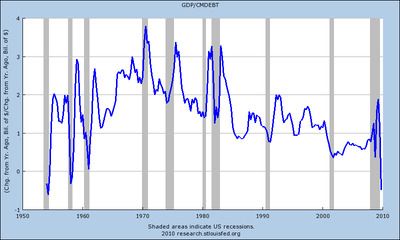 The following chart which I put together from the St. Louis Fed shows the relationship on a quarterly y-o-y basis between increases in U.S. consumer debt and increases in GDP over the last few decades. In essence, it shows that a dollar of new consumer debt mostly produced somewhere between a $1.25 and $3.00 of GDP between 1960 and 1998. (Before that things were wilder, with a somewhat similar GDP/debt relationship to today.) Post 1998, the relationship becomes squishier, with a dollar of debt delivering more like $0.75 of GDP in the 2000s, before the meltdown caused the ratio to spike briefly during the crisis, and then finally turning south altogether. But here is the thing. The growth in debt during the last two decades — both amount and rate — was unprecedented. We should expect a significantly declining marginal contribution to GDP , with no mystery or phase transition required. 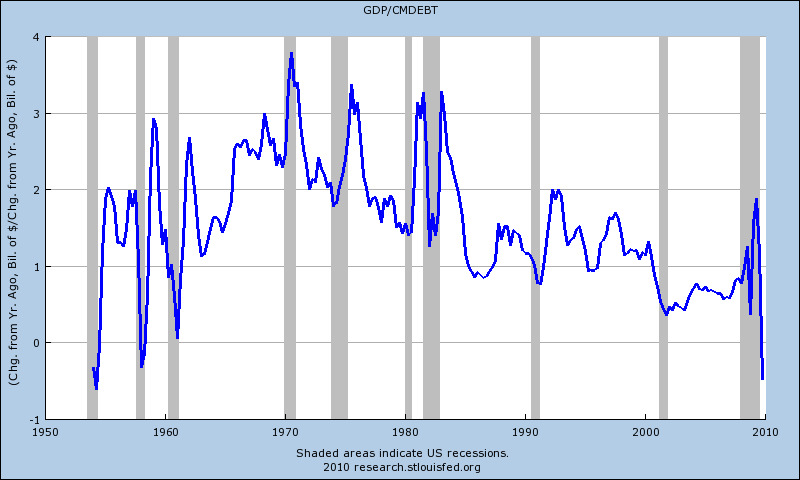 Matter of fact, in recessions before 1970 we saw GDP/debt declines to zero and below, just like we’re seeing today. Now, that doesn’t make the debt OK, because it isn’t and wasn’t, but it also doesn’t mean that, after delevering and time, debt can never again by deployed for profit in the economy.